After a 100-day coaching search conducted about as publicly as it could’ve been, and after swinging and—more importantly—missing on coaches more interested in creating leverage for raises at their current jobs, UCLA finally has its man: Mick Cronin, the 47-year-old firebrand who built Cincinnati into a perennial NCAA tournament participant. Right now, it’s too early to know whether Cronin’s middle-America toughness will translate to the palm-tree-filled streets of Westwood. What is clear, though, is what the hiring process says about a program with more national championships than any other: UCLA is further than it’s ever been from college basketball’s pantheon of bluebloods. It’s been just 11 seasons since Ben Howland took the Bruins to three consecutive Final Fours, but consider what’s taken place the past few weeks. John Calipari used UCLA to get a lifetime deal with Kentucky. Rick Barnes thought long and hard about making the move out west from Tennessee, but ultimately opted to stay put after he got a raise of his own. It looked like Jamie Dixon was set to leave TCU for the Bruins, but a costly buyout was too big an obstacle for UCLA to overcome. Does that sound like a blueblood program to you? As much of a long-shot as it was, taking a flier on Calipari is somewhat defensible, though definitely not smart in hindsight. It was never going to happen. For Barnes and Dixon, though, the snags were buyouts, which totaled $8 million and $5 million, respectively. Not wanting to pay the buyouts makes sense in a vacuum. Looking for value is still important, even at the highest levels of the sport. But this is UCLA we’re talking about. For a program valued in the top 10 in college basketball at $138.4 million, according to an annual study by Indiana University-Purdue University Columbus finance professor Ryan Brewer, quibbling over buyout price isn’t a blueblood move. It feels cheap. If you’re really a college basketball titan, you get who you want, no matter the cost. Meanwhile, as on-court performance has trended downward in recent seasons, fan support has dwindled to unthinkable levels for a program of UCLA’s stature. In 2018–19, UCLA’s average home attendance was 8,269, which is 59.9% of the 13,800-person capacity of the newly-renovated Pauley Pavilion. In head coach Steve Alford’s first two seasons in Westwood—both years in which UCLA made the Sweet 16 in the NCAA tournament—average attendance was even lower. The lone recent spike came in 2016–17, when a fast-paced, high-flying Bruins team led by Lonzo Ball notched an average attendance of 11,183, or 81% of capacity. For a frame of reference, take the attendance numbers from North Carolina and Indiana, two programs that rival UCLA in historical success. In UNC’s worst season ever, an 8–20 campaign in 2001–02 during the second year of Matt Doherty’s three-year stint as head coach, the Tar Heels’ home attendance was 16,319, or 75% of capacity. When Indiana went 6–25 in Tom Crean’s first season in 2008–09, the average home attendance at Assembly Hall was 14,331, good for 82.1% of capacity. Remember, these percentages are from these programs’ worst seasons in history. So, to compare, UCLA is getting a significantly smaller percentage of fans than its supposed peers, even when its basketball team is much better than those peers. It took a transcendent, homegrown college talent in Ball to even bring UCLA’s average attendance to that of Indiana’s worst season since World War II. Los Angeles certainly has more going on outside of college basketball than Bloomington and Chapel Hill do, but the numbers reveal a level of apathy from the UCLA fan base that suggests a precipitous fall from the highest echelon of college hoops. These figures also highlight a disconnect between the championship-level expectations and the reality of the situation in Westwood. At least, for Cronin’s sake, the Bruins will exclusively take charter flights next season, which hasn’t been the case in the past. Programs like Dayton and Northwestern chartered all flights before UCLA. That’s telling. 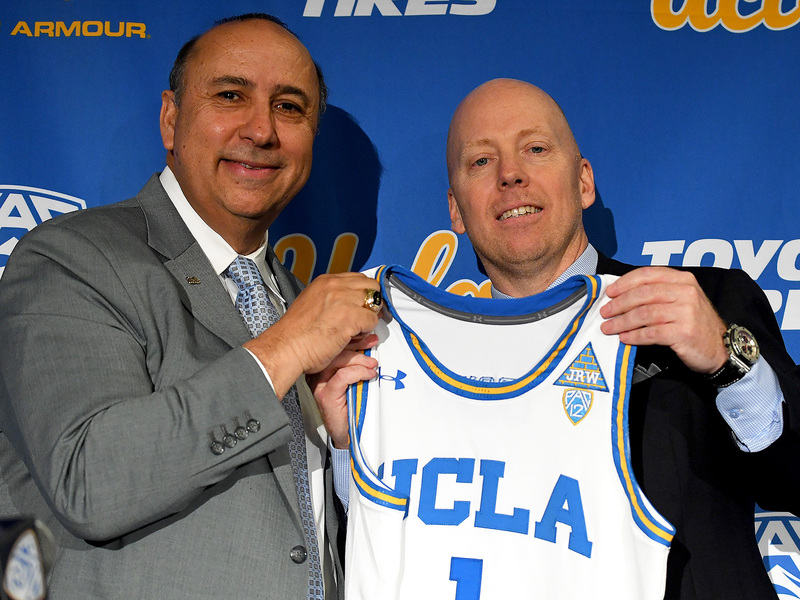 Because UCLA’s coaching search unfolded so publicly this offseason, Cronin begins his new job with the stigma of being the Bruins' third or fourth option. That comes on top of the immense pressure that’s already baked into coaching one of the most historically successful programs in college hoops. Throughout his introductory press conference, Cronin referenced “the four letters,” at various moments while pointing to the “UCLA” pin on his suit jacket. When discussing “the four letters,” he spoke of a program legacy to uphold, a lofty responsibility to the school and a draw to help lure prized recruits to Westwood. In some ways, Cronin’s right. UCLA is a program with a history unparalleled in the college game. Its alumni network is a who’s who of basketball legends. Its location remains second to none. In a wide-open and recently downtrodden Pac-12, Cronin should be able to make waves early as a proven coach who can now recruit with more resources than he’s ever had. Altogether, the program still has more built-in advantages than most. But the turbulence of this offseason’s coaching search, taken in the broader context of the past decade of UCLA basketball, shows the Bruins are lagging behind the top tier of programs. At this point, “the four letters” are mostly just that. Four letters.